Product prices and availability are accurate as of 2019-04-03 21:04:38 EDT and are subject to change. Any price and availability information displayed on http://www.amazon.com/ at the time of purchase will apply to the purchase of this product. Model: CQ522A#1H3 Gain the versatility to tackle it all from home. Fax, scan and copy unattended, and handle two-sided documents, using the 50-page automatic document feeder. Print lab-quality photos directly from the all-in-one, using memory card slots and the color display. Print at your convenience-whether it's from across town or across the room-using HP ePrint. Print and share from multiple PCs, and stay connected, using integrated wireless and wired networking. 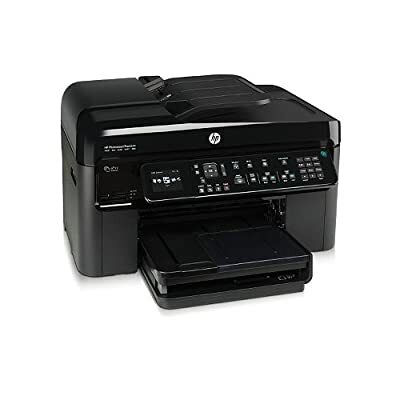 Wirelessly print directly from a smartphone, using HP mobile printing applications. Print from the Web without a PC-coupons, recipes, greeting cards and more-directly from the color display. Have more fun with your photos with HP Photo Creations software, and get tools to make photo printing even easier. Use the color display to print photos and make copies, scans and photo reprints. Make the most of fun and useful templates for calendars, games and more, using HP Quick Forms. Conserve resources and save energy. Count on affordable, individual inks for long-lasting photos, and get a better value for frequent printing. Save time and paper by printing two-sided documents automatically. Save energy and print more responsibly, using an all-in-one that is ENERGY STAR qualified.